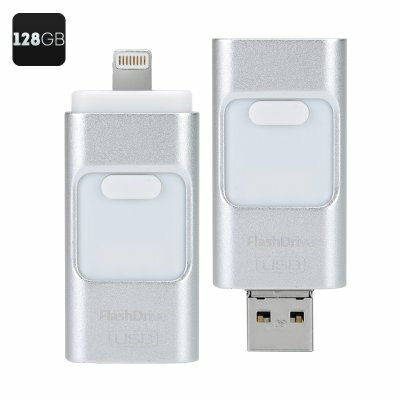 Successfully Added 128GB Multi-functional USB FlashDrive - High Speed USB 2.0, Triple Windows, Android, iOS Interface to your Shopping Cart. Quick ,safe and secure storage with this 128GB Memory pen suitable for Windows, iOS and Android devices. Expand the memory of phones, tablets, TV boxes and computers in seconds thanks to this 128GB memory pen. If your phones or tablet has hot limited storage then this 128GB of memory pen is a real blessing. helping you transfer, backup and copy your valuable data this memory pen makes sure that should your devise run out of space you won't have to sacrifice any files to keep working. Suitable for all manner of decides from phones to computer this memory pen will work on phones or tablets with OTG functionality. The nifty design includes all the connectors you need, including iOS as well as USB and joint mini USB port. if your phone tablet or other electronics support OTG, such as Samsung Galaxy Note, iPad, iPhones and other windows, iOS or Android devices it wioll work with this fancy memory pen.